What will you do if some wizard bestowed upon you the abilities of six immortal elders- Wisdom of Solomon, Strength of Hercules, Stamina of Atlas, Power of Zeus, Courage of Achilles, Speed of Mercury? But you are a 14 year old kid whose life has been out of order. How will you manage these superpowers? Will you help people with these abilities or use your powers for selfish reasons? DC’s latest film Shazam! revolves around a 14 year old foster child Billy Batson (Asher Angel) who is magically transformed into a superhero everytime he shouts the word Shazam. Shazam! is both joyous & fun, albeit for very different reasons. It is a film about wish fulfillment. Director David F. Sandberg keeps the story simple & clean. The fact that it’s hero is a teenager & isn’t carrying the weight of the world on his shoulders benefits the film greatly. Billy & Freddy Freeman(Jack Dylan Grazer) have the time of their lives trying to figure out limitless abilities that have been bestowed upon one of them. Zachary Levi is a charmer. He makes for a very convincing superhero who is actually 15 year old boy in a man’s body be it toying with a security guard at school or shooting lightning bolts from his hands while he dances & makes up new Shazam themed lyrics to ‘Eye of the Tiger’. For a while we are convinced that Levi is probably 15 in the end. Asher Angel matches the charisma as the younger version of Shazam. He acts with countless expressions & they work everytime. Jack Dylan Grazer who rose to prominence in the horror film IT delivers a wonderful performance as Billy’s best friend. Mark Strong who starred in the flop film DC’s Green Lantern said he had some unfinished business with DC films. He portrays the villain Thaddeus Sivana who releases the ghoulish creatures- Seven Deadly Sins. Even though he didn’t make too much impact but acted well as per the script. The actors are delight to watch. Grazer, Angel & the entire foster siblings- these kids are gold. Be it Stranger Things, IT or Harry Potter whenever there is a plot involving school kids, I always have a soft spot in my heart. The story of Shazam is actually simple. It makes us feel happy & warm because it’s heart is set firmly in the right place. It’s about infallible friendship, families that are not by blood but so much stronger, simpler & nicer things like innocence, hope & courage. It’s references to Batman & Superman work for everyone because of their popularity. I recommend watching Shazam before the more serious & more intense Avengers: Endgame hit theatres & takes an emotional toll. And also we have Game of Thrones final season incoming………. Author sahilkadu96Posted on April 13, 2019 April 13, 2019 Leave a comment on Lightning strikes in Shazam! What do you see beyond that strength? A planet destroyed at the hands of an evil emperor. A powerful race reduced to nothing. After destruction of Planet Vegeta, three Saiyans were scattered among the stars, destined for different fates. While two were living peacefully on earth, the third one was raised with a burning desire for vengeance & developed unbelievable power. And now with the evil emperor getting revived once again, he brings this Saiyan on earth. Goku & Vegeta run into an unknown Saiyan Broly in whom they discover a malevolent destructive force! Dragon Ball Super: Broly is the latest film to enter the franchise. Helmed by director Tetsuya Nagamine & written by series creator Akira Toriyama this film is about the legendary Saiyan Broly. But can a franchise 30 years old still add something new to the plate? We are about to find out! The strength of this film lies in the first arc. The film takes its time to establish backstory of the characters. The flashback scenes revisits the time when King Cold crowns Frieza as the new emperor on Planet Vegeta & King Vegeta bows in front on them not due to respect but fear. We meet Goku’s parents- Bardock & Gine. Bardock is suspicious when Frieza asks about the Super Saiyan & Super Saiyan God. His suspicions led into iconic Superman-esque origin scene for our beloved hero adapted from the manga “The departure of the fated child”. This film is all about Broly. He is born with a higher power level than that of Prince Vegeta. Due to this he is banished to a inhospitable planet. His father Paragus eacapes to protect & train him. This noble act then becomes psychological manipulation & misuse of power. He is innocent & subtle. His relationship with his father is more of a master slave like. He will never speak ill of his father. He is a victim of hatemongering politicians the ones who deemed him a monster even before he walked & spoke his first word. He might be intimidating due to his hulking personality but deep down inside he has a heart of an innocent kid. He has a strong sense of justice. This is shown when he saves a female soldier from getting harrassed from a General in Frieza’s army. She develops feelings for him which becomes important later in deciding the outcome of the battle. The fight comes long way in the second half of the film. When the Saiyans kickoff, it’s like fireworks. The battle scenes are impressive throughout. The animation is visually sumptuous with some of the top animators in Japan- Naohiro Shintani, Naotoshi Shida & Yuya Takahashi are working to shine every frame. The fight is shown from Broly’s point of view. You will feel what’s it like to be a Saiyan. You will begin to root for him Vegeta isn’t reduced to a second fiddle this time. Even Goku pulls up new moves never seen in history of Dragon Ball. Broly’s power evolves during the heat of battle but this power comes at a cost. He loses his mental stability & goes on a rampage killing everything that moves. This fight wasn’t just about the kamehamehas, it was about the legacy of Saiyan warrior race. What I loved is it gets the Super Saiyan transformation right in all aspects. A transformation must carry the necessary emotional heft- remember the first time Goku went Super Saiyan; even this flashback is shown. The final outcome is rather interesting & opens door for new arc. What does existence of Broly means for Goku & Vegeta? What if Goku & Vegeta weren’t supposed to attain the Super Saiyan mark? Was Broly born to be the Saiyan of a legend? Overall this is a film that will please every DBZ fan even if they haven’t watched the latest series. There are lot of iconic moments in Dragon Ball but the franchise has never been so good before. This film is everything about the series- it’s past, present & future. By the time of writing this blog, this film has already become Dragon Ball’s biggest film till date. If they can still produce this level of content, I don’t see any reason why this franchise should end anytime soon. Author sahilkadu96Posted on January 19, 2019 January 19, 2019 Leave a comment on What do you see beyond that strength? Two souls meet like two ships stranded in the sea destined to find each other. A child is born but he is a product of love that should never have been. These opening minutes decide that this is unlike any other DC film that we have ever seen before. Horror maestro James Wan took the reign of DC’s franchise to do the unthinkable. Aquaman follows Arthur Curry on his journey to claim his throne & save Atlantis or maybe the whole world. His half brother Orm looks to unite the denizens of the ocean & to bring an all out war on surface people. Aquaman story has same age old Shakespearean elements- despotic rulers, brothers feud but it’s Wan’s execution of vision that makes it unique. He creates characters that are fully fleshed out, with all individual arcs overlapping simultaneously in a captivating world. The underwater world of Atlantis is a beautifully realised fantasy realm filled with different kingdoms measuring the scale of Lord of the Rings giving the film a genuine depth. Jason Momoa adds more layers to Arthur & plays him with emotional intelligence. Momoa himself is a child of two worlds- his father is of Hawaiian descent & his mother is European. He knows exactly how to play the role- shunning differences & accepting those who aren’t like us. Patrick Wilson’s Ocean Master add spice to this siblings rivalry. He delivers every line with soaring intensity that makes the script looks good. Also, Black Manta, a ruthless pirate gets his own developed arc. William Dafoe (Green Goblin from Spider-Man) plays Vulko who is like Obi-Wan to young Arthur. But it’s not about the men, the women are in no mood to be damsel in distress. The basic notion is always a male hero saves a girl. Aquaman breaks those stereotypes. Amber Heard’s Mera is a beautiful princess who uses her own skillsets & wit to gain upper hand in battle. Her relationship with Arthur evolves as the following on progresses. Nicole Kidman is quite good as Queen Atlanna in her brief role. Coming from a horror background, Wan handles action scenes like a seasoned veteran. The action scenes are absolutely bonkers- a flare lit dive through a swarm of sea beasts, a swashbuckling chase across the sun dappled Sicily & a truly epic final battle that rivals Star Wars & Avatar. At the Trench, Wan is in his element of his own. Aquaman feels less like a superhero film & more like fantasy- albeit more mythic. With other movies like Saw, The Conjuring, Insidious, Furious 7 under his belt, Wan’s directing career is still in it’s ascendancy. The Sun sets in Los Angeles! Stan Lee, the man who started the Marvel revolution passed away at the age of 95. This news just came suddenly when I was in my office going for lunch & suddenly my friend announced this sad news. I was shocked wondering is this a joke but then I checked on the internet & unfortunately the news was true. His biggest contribution to Marvel was the entire Marvel universe itself. In collaboration with Jack Kirby & Steve Ditko, he created cavaclade of Marvel heroes- Hulk, Thor, Dr. strange, Iron man, Black Panther, Avengers, X-Men but his grandest creation is your friendly neighborhood, Spider-Man! Just like you can’t imagine physics without Newton, you can’t imagine Marvel without Stan Lee. His way of doing things was to brainstorm the story with each & every artist like how everyone want a story to be told & then write a synopsis. As a writer Lee was known for his gift with words. This process became known as the Marvel method & it allowed him to be the X-factor behind the scenes. The result was an immersive narrative sprawl that elevated into something better. It also piqued interests of readers from one comic to another making them hungry for more. He added a new layer of complexity & humanity to superheroes. His characters were fantabulous but flawed. They had love & money worries, endured tragedy & feelings of insecurity. He gave us a world where we could escape into. A world filled with heroes who inspired us, who always made us believe in good. Before the dawn of superheroes, America did not have any mythology or epics like Ramayana, Mahabharata & Amar Chitra Katha. We can say that he contributed in creating a new mythology for the U.S. He is the embodiment of imagination, the trendsetter in entertainment. The MCU has become a $20 bn machine delivering blockbusters consistently with no signs of slowing down. What Marvel has done became the envy of Hollywood. He is the real superhero, the man behind the myths……May his soul rest in peace. Author sahilkadu96Posted on November 17, 2018 November 17, 2018 Leave a comment on The Sun sets in Los Angeles! There cannot be peace without at first, a great suffering. The greater the suffering, the greater the peace. The end you always feared is coming. It is coming & the blood will be on your hands. This is it……the fallout of your good intentions. 22 years ago, Tom Cruise created the Mission Impossible franchise based on a TV series in which different filmmakers could leave their mark on action cinema. Ethan Hunt is Tom Cruise’s answer to James Bond. With the first film, Brian De Palma crafted an espionage tale stuffed with climax aboard a French bullet train that stands one of the most thrilling pieces in history. With the second film, John Woo transplanted the action from Hong Kong To U.S. J.J. Abrams reinvented the franchise with the third film applying a more serialized storytelling that works as a T.V. pilot. MI 3 was Abrams’ debut movie as a director but his clean direction works that allowed Tom Cruise to reboot the franchise with more recurring characters in the future. Abrams hired Brad Bird to direct Ghost Protocol with former serving as executive producer. Bird propels in globe-hopping narrative creating sensational set pieces in Kremlin, Burj Khalifa & the climatic confrontation in Mumbai. Bird, Abrams & Cruise delivered a smashing successful blockbuster that took the series to new global heights. Enter Christopher McQuarrie who keeps the franchise firing on all cylinders with Rogue Nation. Many view it as a benchmark for the series. McQuarrie who only directed one film (Jack Reacher) before it had a big muscular work to do. But he & his team raised the stakes higher than any previous MI films to deliver the finest product. Just when you think the franchise cannot get any better than previous MI films, here comes Fallout! Once again McQuarrie returning in the director’s chair serving as a direct sequel to Rogue Nation. 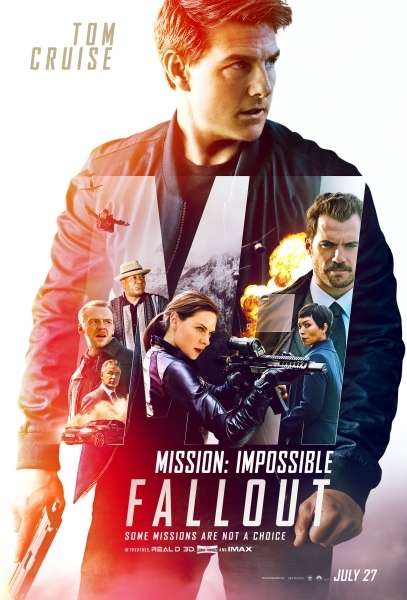 The film is superbly crafted with front loaded action that include fist fights in bathroom, motorcycle chases, HALO jumps, running over rooftops in London & the helicopter battle that wanders within the realm & suspension of disbelief. How Cruise gets out of every situation is exciting & amusing. Tom Cruise never ages & you don’t want him to. His tireless drive to stay on top, his relentless quest to entertain & thrill, he pours his all into it to deliver the best action movie in recent years. There’s no CGI. Cruise does all the death defying stunts by himself. You are waiting for the scene where he breaks his ankle. In short he is ready to die for us. But what attracts us the most is his emotional side. He is morally upright & humane. This is blatantly shown when he helps an injured policewoman. The returning cast include Ving Rhames, Simon Pegg, Rebecca Ferguson. Also Henry Cavill, Vanessa Kirby, Angela Bassett are the new additions. Cavill who never really shone with Superman becomes a force to be reckoned with as August Walker. He bulldozes through every scene without any hesitation. This is Cavill’s moment when he goes one on one with Cruise bringing the much machismo & charisma needed. This is his redemption as an actor. His arm reloading scene has become a new meme. His moustache was worth the moustache gate incident in Justice League. Also Rebecca Ferguson injects the right amount of physicality in her character Ilsa Fraust which makes her Hunt’s worthy adversary & also his love interest. Author sahilkadu96Posted on August 4, 2018 August 4, 2018 Leave a comment on Defying the impossible! Do you really remember the first time you see a dinosaur? You don’t really believe it, do you? Its like a miracle! Dr. Grant look in awe at a grazing Brachiosaurus in this memorable scene, encountering the dinos for the first time. This scene is the most perfect introduction to the park & the entire film series. “Welcome to Jurassic Park” , Dr. Hammond says as John William’s score hits its stride. In June 1993, Steven Spielberg changed the cinematic landscape with Jurassic Park; a monster mash sci-fi piece that shook the foundations of filmmaking. And on its 25th anniversary let’s take a moment to celebrate its legacy of greatness. Spielberg pushed technology into a new frontier by conjuring up unbelievable cine-sights that moviegoers had never seen before. He married digital wizardry to a host od superb practical effects. He & his creative team dedicated millions of dollars in creating those animatronics. That’s what makes Jurassic Park work & that T-Rex breakout sequence still remains terrifying even today! The cast is excellent but the dinosaurs are the real stars of the franchise. Just like Indiana Jones made archaeology cool, Jurassic Park made paleontology cool. But what astonishes me is the fact that there are only 14 minutes of pre-historic creatures on screen. In a movie with 2 hours runtime, it looks sparse but that makes everything so impactful. Its a brilliant example of limitations ultimately serving the story being told. The film won 3 Oscars: Best Sound Editing, Best Sound Mixing & Best Visual Effects. It became first film to reach the $1 billion mark (adjusted for inflation). 22 years later Colin Trevorrow rebooted the franshise with Jurassic World; a monster mayhem with more bigger & lethal dinosaurs. It was a win of technology & nostalgia. Spielberg’s dinos cut, stomped & slashed the box office, breaking the record of The Avengers by earning $1.6 billion worldwide. 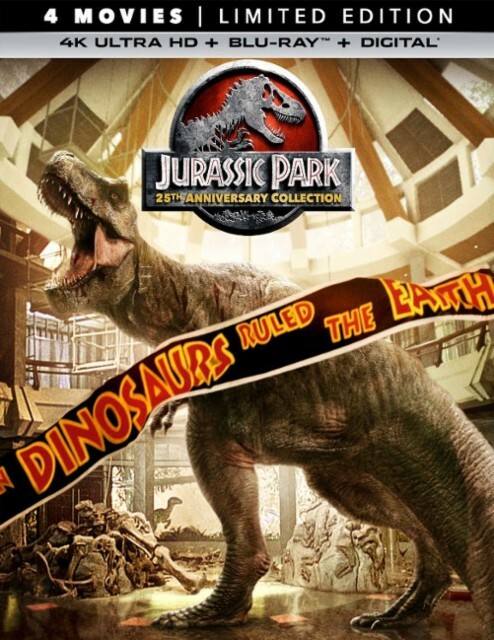 Till today, Jurassic Park remains one of my all time favourite movie & everytime it airs on T.V., I watch it. Thank you Mr. Spielberg, for making Jurassic Park a triumph in pop-culture entertainment! Author sahilkadu96Posted on June 16, 2018 June 16, 2018 Leave a comment on The Park turns 25! Infinity War isn’t just a movie, its a lifetime event! It all started back in 2008 with Iron-Man. And yet after 10 years & 18 movies all that build-up has led us to this moment- an epic cataclysmic event that will redefine what saving the universe really means. But its a gargantuan task of managing more thab 20 heroes in one film. Will the Russo brothers be able to deliver a movie that is worthy of this hype? 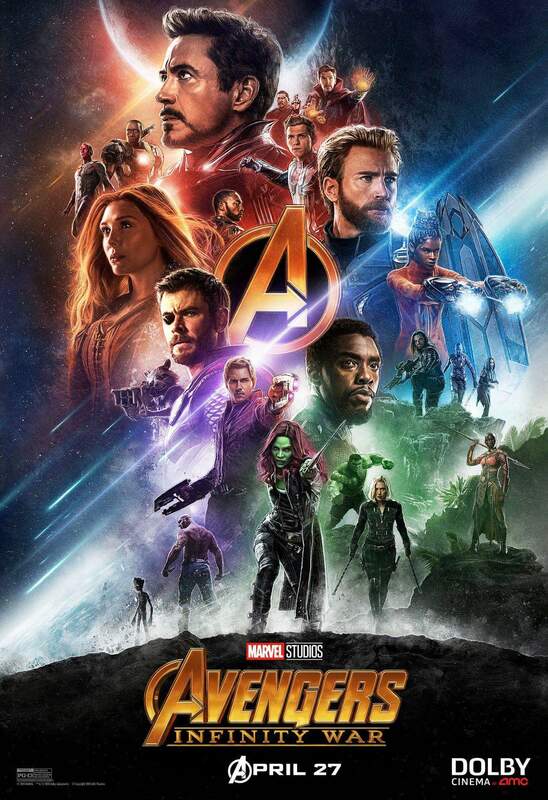 Its hard to juggle an ensembled cast but the Russo brothers did an exceptional job. The action rages seamlessly from planets to planets for 2.5 hours. But there is also time for MCU signature trademark-humour. Spidey’s pop culture references, a machismo banter between Thor & Star Lord, Strange vs Stark, GOTG especially Rocket Raccoon added relief. There were some weird team ups led by the alpha males (yeah, that’s what I call them). Every hero got a fair amount of screentime. Many don’t know each other or the parametes of their shared universe. But Infinity War did not belong to these heroes, it was all about Thanos. To challenge them is to court death..
After being teased in the first Avengers movie, Thanos, the mad titan has finally arrived. A showdown was inevitable. Josh Brolin plays the CGI character but there is also a human side to it. Thanos is the embodiment of madness & the quench for immense power, constantly blurring the lines between a prophet & a survivor. With the population of the universe is expanding & the resources finite, he has to destroy half of the universe in order to bring balance. While others see him as a madman, he sees himself as a God who is willing to do what no one else can. Infinity War is about that staggering loss, the pain & suffering it inflicts without a proper goodbye. You won’t be the same after leaving multiplex basking in the loss of your favourite characters. The strength of Infinity War does not lie in this movie but all the 18 films that came before it- the relationship that we have developed with the characters & the relationship they have developed among themselves. Its a lifetime event. Marvel Studios took a decade to meticulously plan this mammoth showdown. Before 2008, if you would have asked me who Iron-Man was, I would have said that he is just a superhero from Marvel comics. But now these superheroes have become a pop-culture phenomena. Iron-Man, Thor, Captain America etc. have become household names. Infinity War will leave you haunted in your senses & desperately in need of a sequel- proving why Marvel Studios are the real masters of this superhero genre! Author sahilkadu96Posted on May 5, 2018 May 6, 2018 Leave a comment on Infinity War isn’t just a movie, its a lifetime event! sahilkadu96 Create a free website or blog at WordPress.com.